I got this press release in my email today and I thought I would share because it has some great facts about traveling and your luggage. I have always wanted to go to the Unclaimed Baggage Center in Alabama but have not made it yet. Definitely a great idea for a road trip from some of the Southern States. SCOTTSBORO, Ala., March 16, 2017– As travelers head out this March to take advantage of Spring Break, Unclaimed Baggage Center (UBC), a one-of-a-kind store that buys and sells lost luggage from the airlines, shares ten facts about lost luggage and the airlines. "One of the fears of traveling is not finding your bag once you reach your destination," said Brenda Cantrell, brand ambassador for UBC. "We thought we would share what we have learned from over 45 years in the business of lost luggage to clear up some misconceptions." 1.The chances of permanently losing your bag is extremely small. Of the billion or so passenger bags checked every year, roughly 1 percent fail to meet up with their owners at the claim carousel. Within 24 hours, 80 to 90 percent of those "lost" bags are found, and within five days 95 to 98 percent of that 1 percent make their way home. Over the course of the next 90-plus days, through a comprehensive baggage tracing process conducted by the airlines, more than half of the remaining bags are reunited with their owners. 2. Lost Luggage Heads to Scottsboro, Ala.After an extensive and exhaustive 90-day search by the airlines to reunite a bag with its rightful owner, the Unclaimed Baggage Center purchases the unclaimed items from the airlines and the items are brought to the 40,000 square foot store in Scottsboro, Ala.
3. Lost items are thrown away, sold or donated. Only about one-third of the purchased products make it to the floor of the retail store, which accounts for about 7,000 new items being brought to the store floor on a daily basis. Items deemed unsellable are either repurposed or thrown away. 4. Your lost items could be reclaimed for good.Through partnering with multiple mission organizations locally, regionally and around the globe, Unclaimed Baggage Center is able to reclaim more than half of these items for good. For example: Hundreds of thousands of eyeglasses donated to The Lions Club Sight First program; broken wheelchairs rebuilt for handicapped children and adults worldwide; millions of dollars worth of medical supplies donated to developing countries; and millions of dollars in clothing donated to the underprivileged. 5. It's not always the airlines fault.From what we can see, much of the responsibility for lost luggage is with the owner of the luggage. Many of the bags we receive are old, have damaged clasps or are not labeled. It is very difficult for the airlines to trace back luggage that is damaged or not labeled. 6. Checked luggage is only part of the problem.While checked bags account for a large portion of the inventory at UBC, the store also receives a large amount of items left on the plane. Typically items left on the plane are not labeled and the airlines is unable to return them to their rightful owner. 7. People pack more than just clothes.While clothing is the number one item we receive, the store has departments featuring electronics, sporting goods, books, household items, jewelry, formal wear, toys and much more. 8. Lost luggage can contain the rare and unusual. Throughout the years, Unclaimed Baggage has received about anything you can think of including moldy cheese, wedding dresses, rare heirlooms and artifacts, a live snake, musical instruments or expensive jewelry. 9. While not the norm, unclaimed baggage can contain expensive items. UBC has received several high dollar items including jewelry, electronics and historical documents. The highest price item the store sold was a Men's Presidential platinum Rolex valued at $65,000 and we sold it for $23,000. 10. 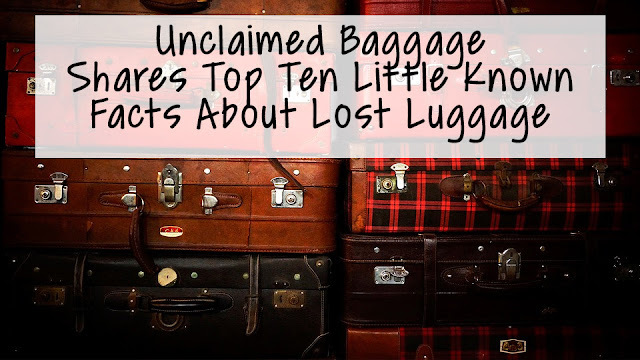 Lost luggage creates a truly one-of-a-kind shopping experience.Unclaimed Baggage Center covers more than one city block and attracts over 1 million visitors a year from every state and over 40 foreign countries. The store offers something for everyone: treasure hunt and thrifty shopping; clothing, electronics, home furnishings, books, jewelry, trinkets and other unique items. Need to know more? Everyday UBC host an Unclaimed Baggage Experience, where a guest gets to unpack a bag that has never been sorted by the airlines. For more information about UBC, please visit http://www.unclaimedbaggage.com/or follow the store on Facebook, Instagram, YouTube, Pinterestor Twitter.